September was World Alzheimer’s Month, a time for the global community to come together to honor those living with dementia, as well as celebrate the scientists, clinicians, charities and fundraisers working to beat this disease. At Neuro Central, we took this chance to do our bit, not only sharing the latest advances in dementia research and talking to a whole host of experts in the field, but also raising money for two charities that support Alzheimer’s patients, carers and the latest research: Alzheimer’s Research UK (ARUK) and Alzheimer’s Society. Throughout September, we pledged to donate £3 to be shared between the charities on behalf of every new member who joined Neuro Central, as well as donate £1 for every share of one of our #VoicesForAlzheimers posts on Twitter and Facebook. 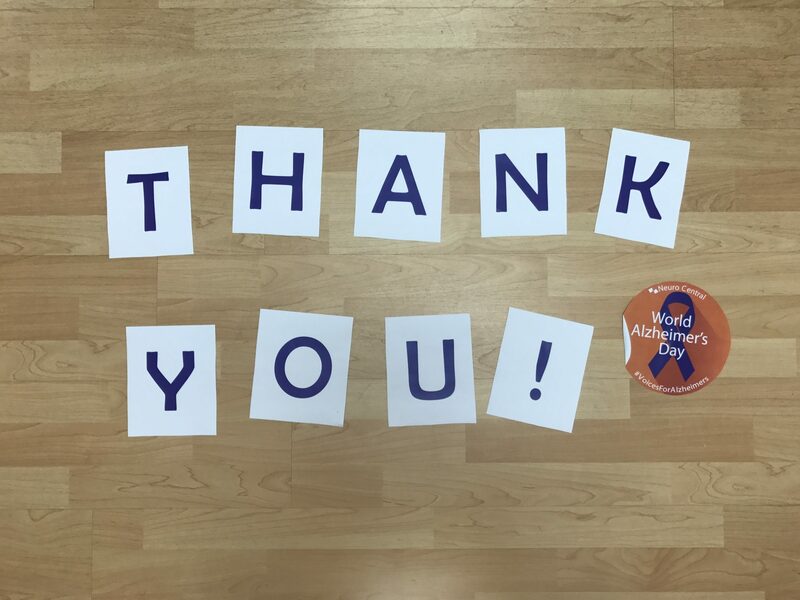 After totaling up all your retweets, shares and sign ups, I’m delighted to announce that you have helped raise £775 for ARUK and Alzheimer’s Society: from everyone here at Neuro Central, we want say a massive thank you! We also want to thank all our supporters and #VoicesForAlzheimers, who shared their Alzheimer’s stories and why raising awareness is so important: you can watch all our #VoicesForAlzheimers here. Plus, take a look at all the other interviews and opinion pieces from dementia researchers and clinicians on our World Alzheimer’s Month homepage, including Nick Fox telling us about the search for dementia biomarkers in the Insight46 study, Claude Wischik on tackling tau, and our Ask the Experts panel discussion on the genetics of Alzheimer’s. Not yet a member? Sign up to Neuro Central for free and receive exclusive access to all content on the site, as well as all articles in our five partnered journals.